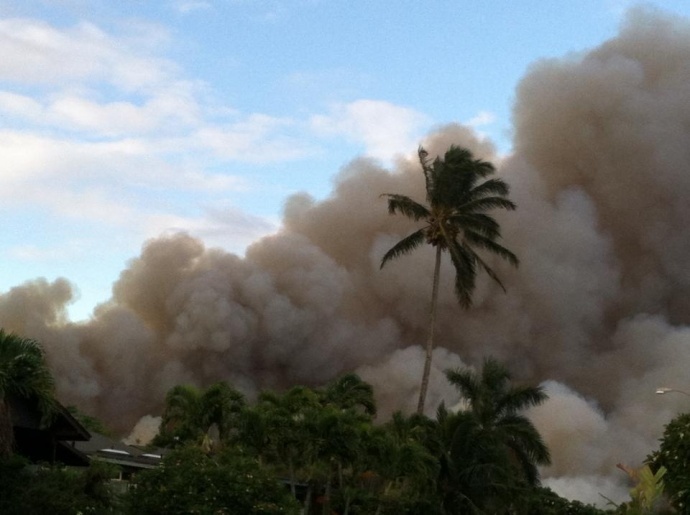 The Maui group Stop Cane Burning has filed a new motion in Second Circuit Court seeking injunctive relief to invalidate the 2015 Burn Permit issued to Hawaiian Commercial & Sugar Company and ban parent company A&B from conducting agricultural burning operations on Maui. The filing comes on the heels of a separate lawsuit filed against the state Department of Health demanding a stop to cane burning. It later added HC&S as a defendant, and then this last week filed another action, demanding the immediate termination of cane burning pending resolution of their lawsuit. 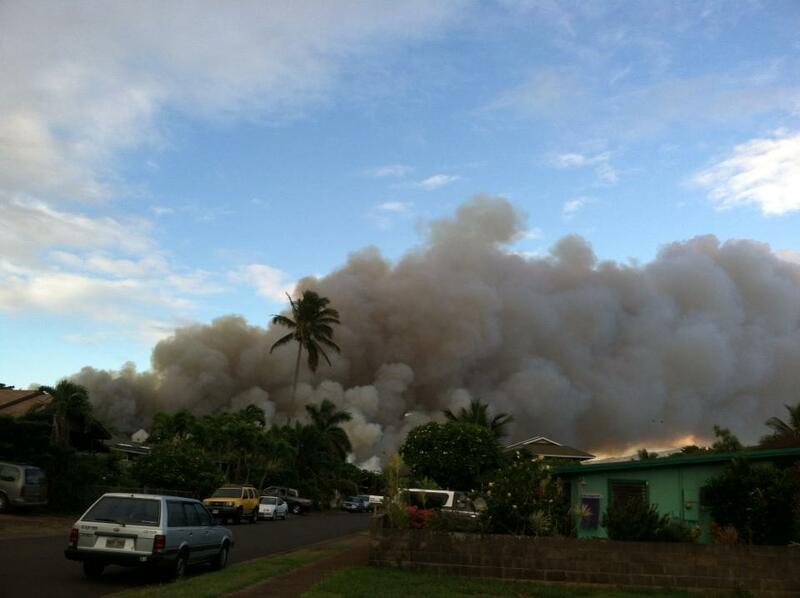 Cane burning 9/23/13, Kahului side of Baldwin Ave. Photo courtesy Valerie Toro. Cane Burning protest. File photo Sept. 2012 by Wendy Osher. 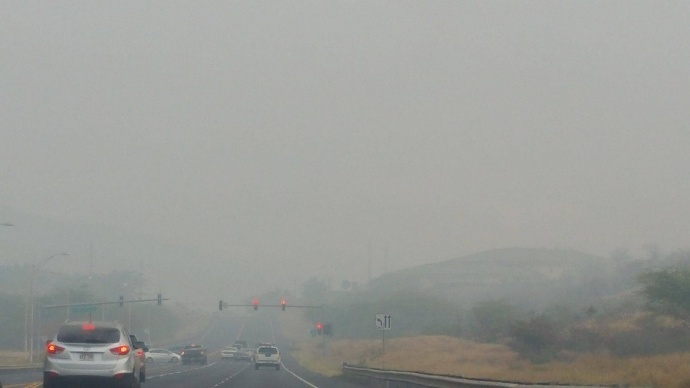 The 912-page filing alleges that the Hawaiʻi Department of Health, through their issuance of an open burn permit, violated the public trust doctrine by putting the public’s health at risk. 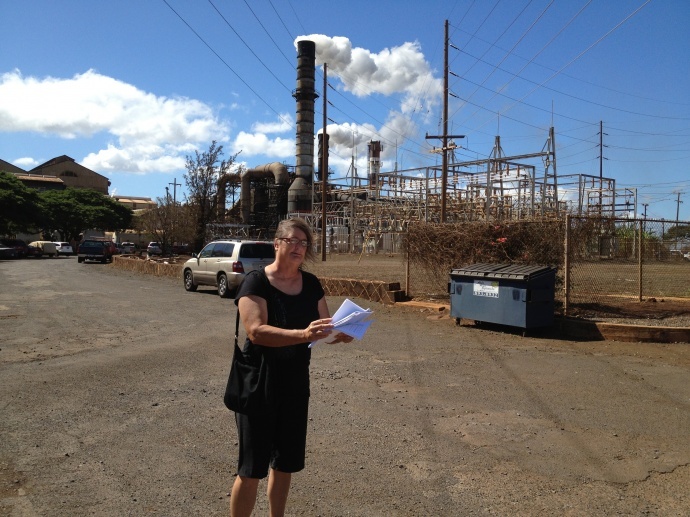 Stop Cane Burning Maui Founder Karen Chun commented in an organization press release saying, “we are all guaranteed the right to clean and healthful environment by the Hawaiʻi Constitution and that includes the right to clean air. 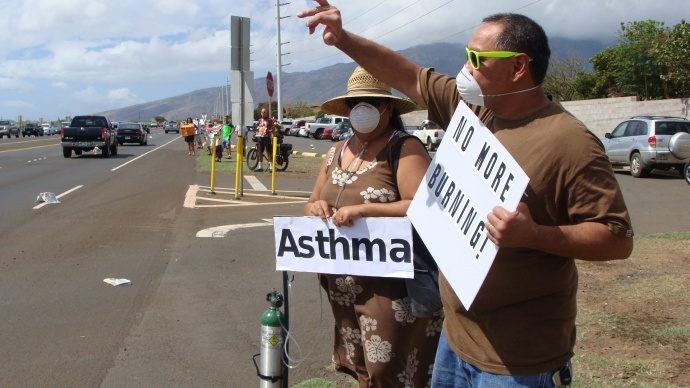 HC&S cane burns are a clear violation of Hawaiʻi’s constitution and should have been stopped back in 1971 when we already had proof of lung damage. How is it that 44 years have gone by and HC&S is still allowed to make our kids sick,” Chun asked. Chun continued calling cane burning an “anti-jobs practice that also substantially puts the public’s health at risk.” The court filing asserts that sugar companies in other countries such as Australia, have switched to green harvesting techniques without cutting into profits. “If those people complain about burning cane–if they can support 800 workers–then they have a right to speak; but my point is who are they to say how to run the lifestyle of the island,” said Charles Jennings, HC&S retiree (front left) during a demonstration backing HC&S’s lifestyle and jobs in Sept. 2012. File photo by Wendy Osher. 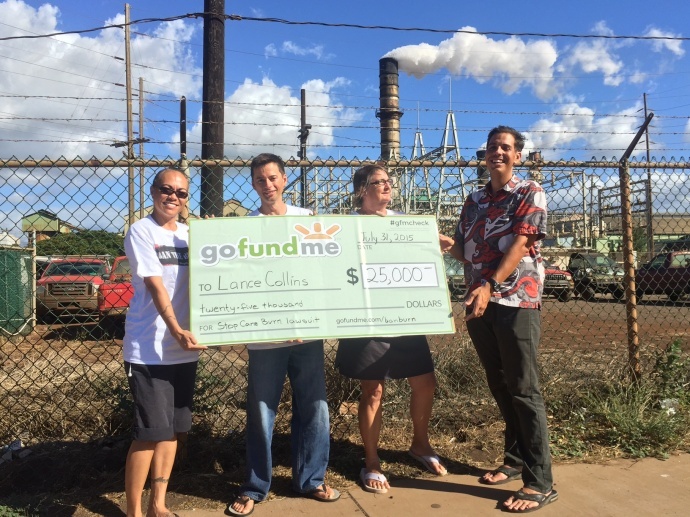 The Stop Cane Burning group reports that it has raised over $25,000 for legal fees in less than a month through a GoFundMe account. 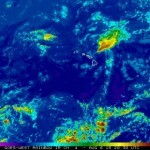 “This shows that the community is concerned about their health and the health of their keiki (children) and ʻohana (family). They’re willing to kākoʻo (support) this effort with financial contributions to aloha ʻāina,” said plaintiff Trinette Furtado. Fellow plaintiff Brad Edwards said, “Burning cane is an environmentally destructive practice.” He claims A&B managment is putting the health of residents and the environment at risk for their own financial gain. 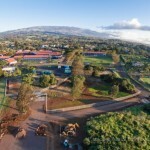 “The highly publicized HC&S burn on May 27, 2015 where elementary school children in Kīhei were seen holding their shirts over their mouths struggling to breath showed just how dangerous and reckless this practice is,” said Edwards. 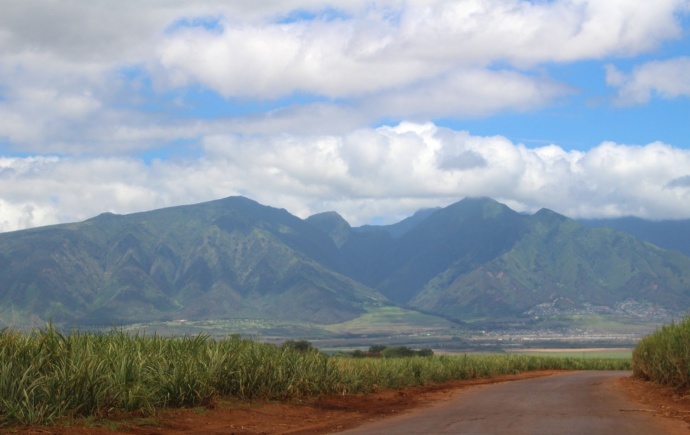 HC&S sugar cane fields in Kahului. Photo by Wendy Osher. 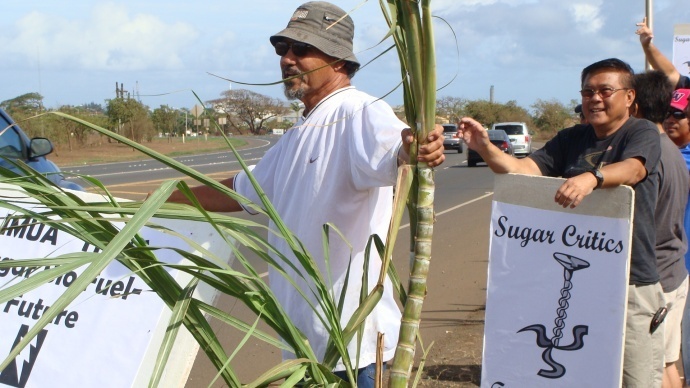 Plaintiff Furtado maintains that the sugar cane industry is not ‘a Hawaiian institution’ and, “it was not kānaka who industrialized it,” she said. “HC&S has had many opportunities to make positive changes but has failed time and time again to take the issue seriously and to start protecting our health and the health of our keiki,” said Furtado. A hearing has been tentatively set for Sept. 16, 2015 in Second Circuit Court before Judge Cardoza. The plaintiffs are Stop Cane Burning, Trinette Furtado, Brad Edwards and Karen Chun. Both the Director of the Department of Health and Alexander & Baldwin, LLC are named as defendants in the filing.